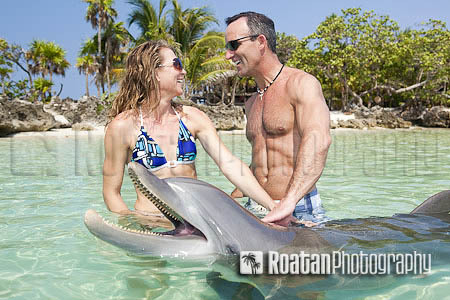 This stock photo shows an attractive adult couple smiling and looking face to face in amazement, while touching a bottle nosed dolphin during a private dolphin encounter session at Anthony’s Key Resort. The dolphin encounter is an exciting and educational way to get to see and feel these amazing animals. The shallow crystal clear water and white sandy beach provides a great environment for the dolphin encounter.